Creating and saving forms in PDF formats is advisable since it is standard format and the layout cannot be altered even when you view it on different devices or browsers. 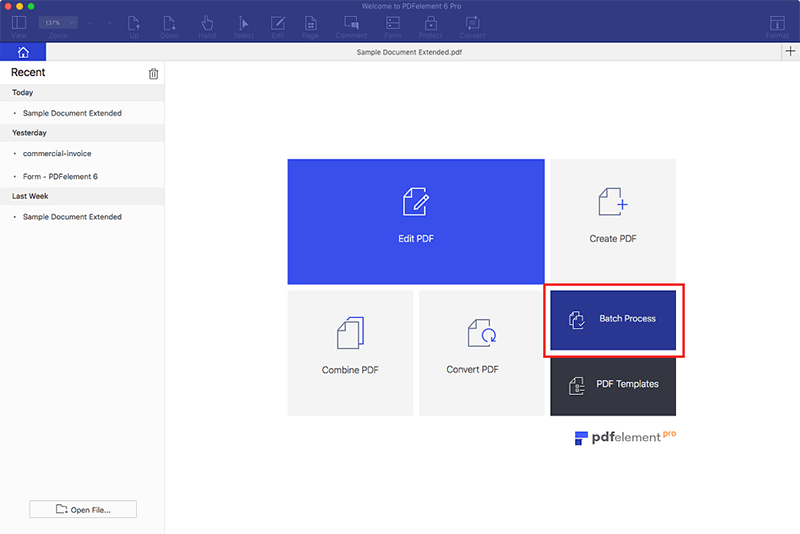 So, when you receive or download a PDF form file and you find content that you want to extract from it, you need to look for a PDF form data extractor. The software should be easy to use and also has the ability to save files in different formats. 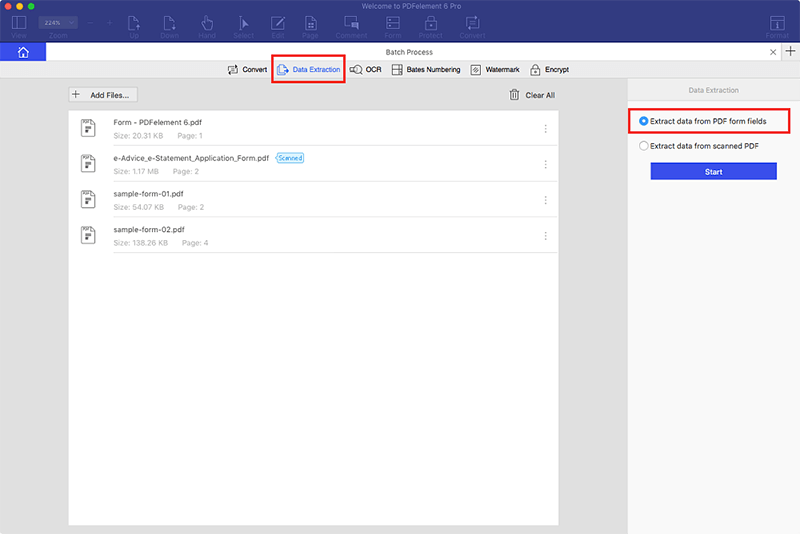 In this article, we will show you how to extract data from PDF form on Mac (including macOS 10.14 Mojave) and the best PDF form data extractor for Mac - PDFelement for Mac. It supports conversion of files like HTML, Images, RTF and Keynotes to PDF formats. It can also convert PDF to output formats like HTML, RTF, TXT, Word, Excel, Images, and eBooks. It empowers you to edit texts, change font color and edit images easily. It can highlight PDF with different colours, watermark, add sticky notes, add links, draw markups etc. It is also a PDF reader with different reading options such as zoom, navigate and availability of thumbnails. Well compatible with macOS 10.14 Mojave. Launch PDFelement on your Mac and upload the PDF form. On the program window that displays the uploaded form click on "Batch Process" button. Then click on "Data Extraction" button situated on the top menu, which will allow you to select the PDF forms that you want to extract data. After uploading the PDF forms, select the button of "Extract data from PDF form fields" at the top right. Proceed and click on "Start" button, select a destination folder. Then all the data will be extracted into a .csv file. Click "Finish" to check the content. In addition to extracting data from PDF forms, PDFelement lets you add handwritten or electronic signatures which can be inserted anywhere on your form. You can also create fillable PDF forms with inbuilt options. Once you are satisfied with the changes made on your form, remember to save the document by navigating to "File > Save" before exiting. Step 1. Upload Your PDF Form: Launch PDFelement on your Mac. Click the "Open File" button on the program and upload a PDF form. You can also upload the PDF form by going to "File > Open". Step 2. Mark the Form Fields: After uploading the scanned PDF file, you can now click on the "Form" button. Then select the "Tasks > Data Extraction" option on the right side menu. A dialogue box will appear. Click on "Extract data from scanned PDF" and then click the "Next" button. From there, then use the mouse to mark the section that you want to extract data. For each filed you have to name it on the window that will appear on the top right of the screen. After that, save the setting and confirm that you have finished marking the form. Step 3. 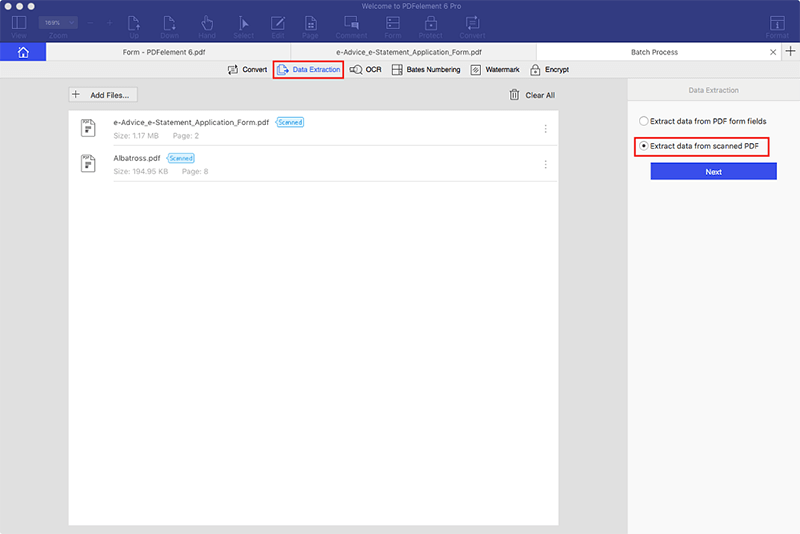 Extract Data from Scanned Form Fields: Next, you need to add all the scanned PDF forms in the same appearance by clicking on the "Add Files" button. 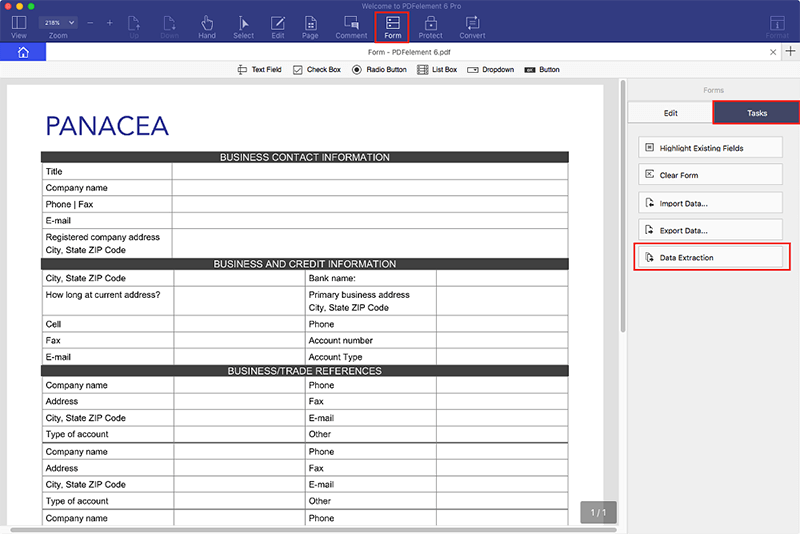 Upload all the PDF forms and choose the output option, which is the option that you created in the step above. Click the "Start" button to begin the extraction process. When the process is complete, click on "Finish". You will find that all the data you need are saved in a CSV file.